Continue to enhance ICANN's accountability (and transparency, which is viewed as a part of accountability). The implementation of the accountability framework, metrics and benchmarks is an important step in evolving ICANN's performance measurement discipline. This process is aligned with broader measurements of performance being implemented as part of ICANN's Management System to support continuous improvement. One World Trust is an independent, UK-based organization that conducts research, develops recommendations and advocates for reform to make policy and decision-making processes in global governance more accountable to the people they affect. Analysis of the accountability policies and practices of three multi-stakeholder, international non-profit organizations, to establish their current level of accountability in comparison with ICANN, and identify useful learning opportunities. 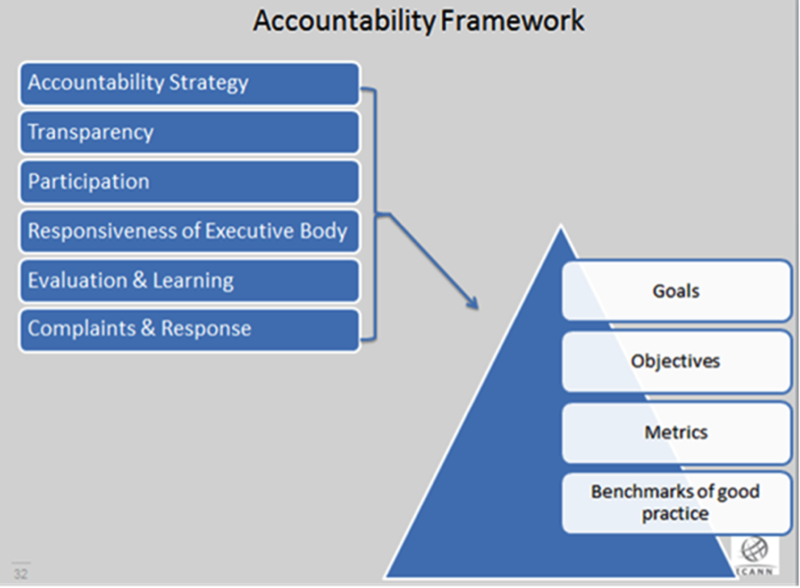 OWT provided a framework and practical suggestions for metrics within each of the six dimensions of Accountability (see Accountability Framework below), and recommended that ICANN staff determine specific metrics, including appropriate targets. This work will be integrated with the development of organization-wide performance metrics as part of ICANN's Management System, which will include: Key Success Factors and Key Performance Indicators used to plan and measure performance against the Fiscal Year 2015 Operational Plan and Budget; and trend lines demonstrating performance over time illustrated with Executive Dashboards. OWT found that ICANN has performed well in comparison with other, similar organizations, and they suggested some areas where ICANN accountability could be improved. These recommendations will be considered in conjunction with the recommendations [PDF, 3.46 MB] of the Accountability & Transparency Review Team (ATRT2) and will be implemented, as appropriate. Next steps will include a community briefing and discussion at the ICANN Singapore meeting as part of the "Management System Linkage" session, and additional presentations and discussions, as needed, to gather community input. ICANN recognizes that this is the beginning of an improved process of continuous improvement and evolution, and in line with OWT's recommendation, staff will begin the implementation with a "pilot," including a selection of accountability metrics to illustrate reporting mechanisms and to collect community feedback. Revisions will then be considered and a long-term implementation plan developed. We welcome your feedback, ideas and questions. Please send your communications to accountabilitymetrics@icann.org.